Sylvia Plath (October 27, 1932 – February 11, 1963) was an American writer. She was most well known for her poetry, but she also wrote novels, children's books, and short stories. Her most well-known novel is The Bell Jar, which was partly based on her life. She married another famous poet, Ted Hughes. She suffered from bipolar disorder and killed herself in 1963. Plath was born in 1932 in Jamaica Plain, Massachusetts. Her parents were called Otto Emile Plath and Aurelia Schober Plath. Her father, Otto, was from Germany; her mother was Austrian American. He was a college professor and wrote a book about bumblebees. Aurelia Plath was ten years younger than her husband. In April 1935, Plath's younger brother Warren was born. The family moved to Winthrop, Massachusetts in 1936. This was where Aurelia had grown up. Plath published her first poem here, when she was eight. It was in the children's section of a newspaper called the Boston Herald. In 1940, Otto Plath died. He was buried in Winthrop cemetery. In 1942, Aurelia and the children moved to Wellesley, Massachusetts. Plath went to Smith College. After her third year, she became a guest editor for a magazine called Mademoiselle, and spent a month in New York City. At this time, she became depressed. She tried to kill herself by taking too many sleeping pills. After she took the pills, she crawled underneath her house, but she was found and taken to hospital. She went to a mental hospital called McLean Hospital and was treated for her depression. She was given a treatment called electric shock therapy. She began to improve and was able to graduate from Smith College in 1955. Plath then went to the University of Cambridge in England, on a scholarship called the Fulbright scholarship. She attended Newnham College, Cambridge and carried on writing poetry. She also wrote for the student newspaper at Cambridge. At a party she met an English poet called Ted Hughes. She married him on June 16, 1956. After they were married, Plath and Hughes went to live in the United States. Plath taught at her old college, Smith College. They met and became friends with a poet named W. S. Merwin. Plath found out that she was pregnant. They moved back to England. They lived in London for a while, and then in a small town in Devon called North Tawton. 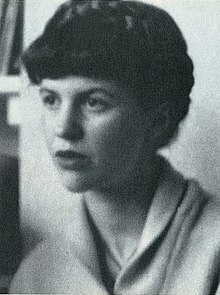 Plath published her first collection of poems. It was called The Colossus. In February 1961 she had a miscarriage. She wrote about her miscarriage in some of her poems. Plath and Hughes' marriage was unhappy. Hughes had an affair with a woman called Assia Wevill. Plath and Hughes separated (lived apart) in 1962. Plath moved to London with their children, Frieda and Nicholas. In 1963, Plath committed suicide at her London home. She sealed the room she was in with wet towels, turned the gas oven on and put her head inside the oven. She died because she was poisoned by carbon monoxide gas. Some people think that she did not mean to kill herself. Her body was buried in a small village in West Yorkshire called Heptonstall. ↑ 1.0 1.1 1.2 1.3 Steven Axelrod. "Sylvia Plath". The Literary Encyclopedia, 17 Sept. 2003, The Literary Dictionary Company (April 24, 2007), University of California Riverside. Retrieved 2007-06-01. ↑ "Sylvia Plath (1932-1963)". pseudonym Victoria Lucas, Books and Writers, www.kirjasto.sci.fi (2000). Retrieved 2007-06-25. ↑ "Sylvia Plath". UIUC Library Online, University of Illinois at Urbana-Champaign. Retrieved 2007-06-25. ↑ Marie Griffin. "Sylvia Plath - Poet". "Great talent in great darkness", Bipolar Disorder (2007 About, Inc.). Retrieved 2007-06-25. ↑ Richard Whittington-Egan. "Ted Hughes and Sylvia Plath—a marriage examined". Contemporary Review (February 2005). Retrieved 2007-06-25. ↑ Peter K. Steinberg. "Biography (1956-1963)". A celebration, This is; www.sylviaplath.info. Retrieved 2007-02-28. This page was last changed on 16 July 2018, at 05:53.